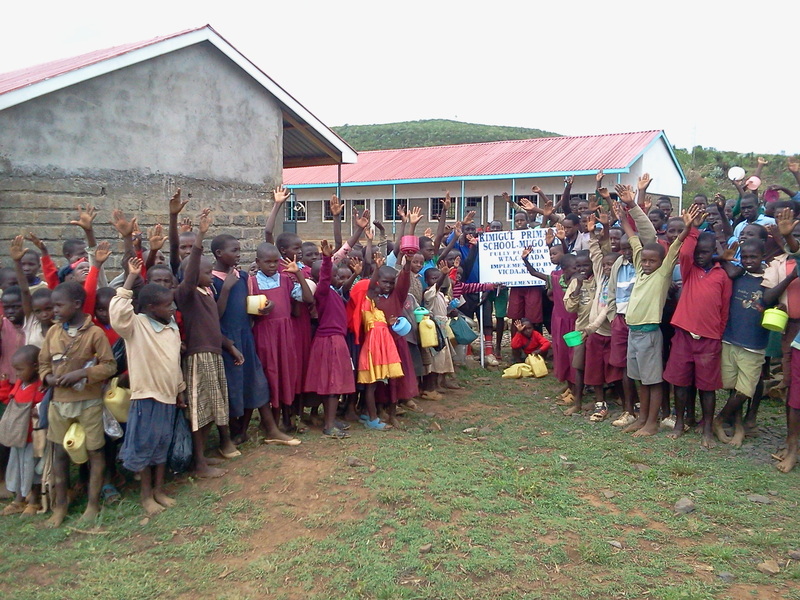 Students from Lemolo A pose in front of their new school. After VICDA and her donors provided social amenties to GIWA Farm community in Rongai Constituency, Nakuru County, the organisation moved to Lemolo community in Rongai constituency, Nakuru County. 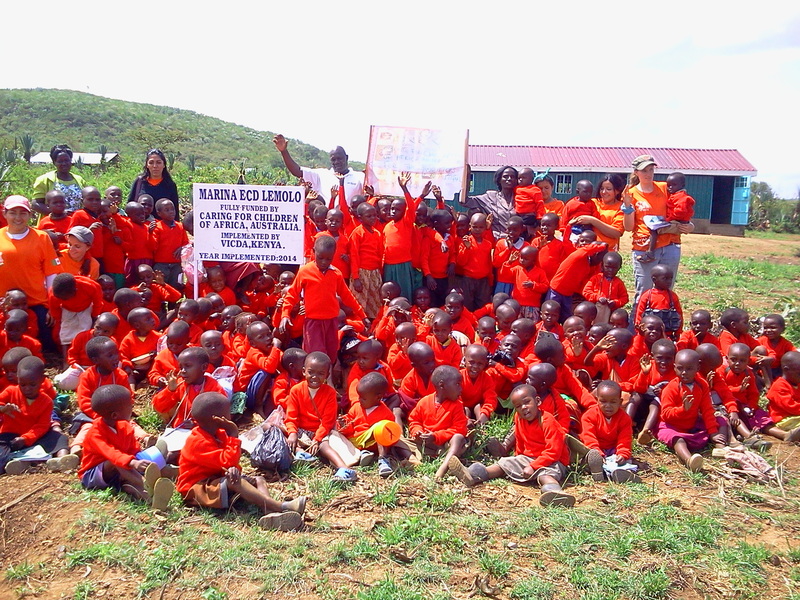 Here they have been working to provide social amenities to Lemolo community such as construction of a complete primary school from class 1 to class 8, toilet blocks and administration blocks, fully funded by World Teacher Aid (WTA) in Canada. Now the Lemolo A children have access to the education and the school has 357 kids so far. The Kenyan government has been good enough to provide enough teachers. WTA in Canada has also been kind enough to fund the buying of text books and school desks. From Lemolo A we are now moving to Lemolo B to build another primary school. Lemolo students show off their new sweaters, thanks to Caring for the Children of Africa. An Early Childhood Education Development school for children from 3 years to 7 years of age is generously Funded by Caring for Children of Africa in Australia. This has been followed by school feeding programs in both Lemolo A and B which has also been fully funded by Caring for Children of Africa. It has been very difficult for the families to provide meals for themselves because they have not yet settled and they have no source of income within the area. Their only source of income is through farming where they hope to have their first harvest in six years – projected in October 2014. 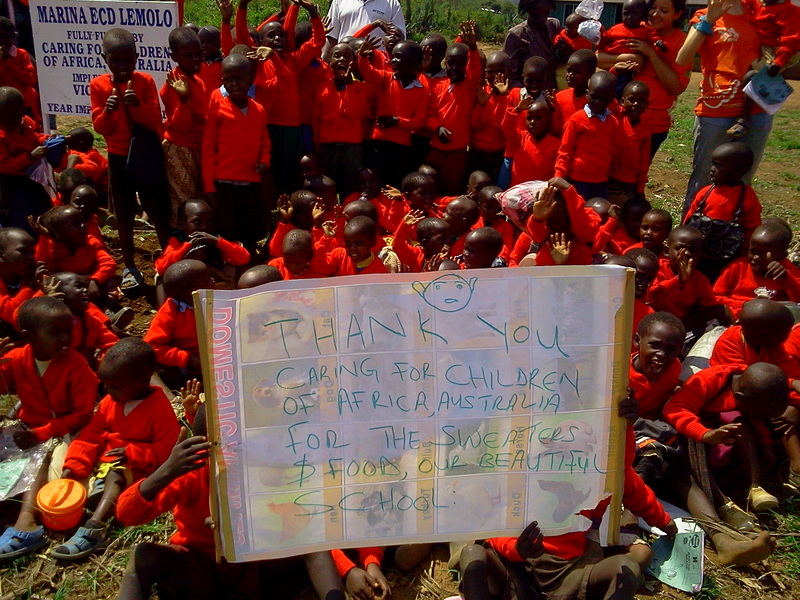 Caring for the Children of Africa has also provided sweaters for children in the Early Childhood Education program. Sweaters were provided before winter arrived to Kenya and now littles ones will remain warm in school. VICDA has also been able to provide water for this community through piping of water from a source 9 kilometers distance away. This project has been fully funded by Global Volunteer Network Foundation in New Zealand.. The project will be completed in early July 2014. At that time both lemolo A and B community will have access to water. Residents from Lemolo Camps are cared for during a recent medical camp. Lemolo community A and B community are 13 and 17 kilometers away, respectfully, from the nearest health facility. 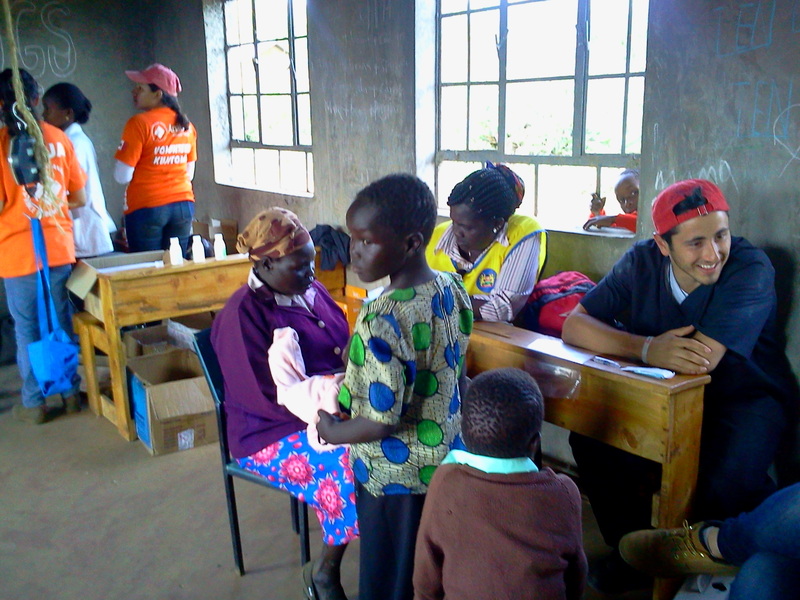 In the month of June ,2014 VICDA provided a two week medical camp to both Lemolo A and B. The government provided medical practationers and VICDA volunteers from Mexico joined them for two weeks to assist. The health situation within this community is very fragile and still in need alot of attention.